High-resolution genetic mapping of Xa27(t), a new bacterial blight resistance gene in rice, Oryza sativa L.
Bacterial blight of rice, caused by Xanthomonas oryzae pv. oryzae (Xoo) (Ishyama) Dye, is one of the serious diseases prevalent throughout Asia. In a previous study, a resistance (R) locus was transferred from the tetraploid wild rice Oryza minuta to the cultivated rice species, Oryza sativa L. Here, we report the fine genetic mapping of the R locus, tentatively designated as Xa27(t). We performed disease evaluation with an Xa27(t) near-isogenic line, IRBB27, testing 35 Xoo strains collected from 11 countries. The Xa27(t) locus conferred a high level of resistance to 27 strains and moderate resistance to three strains. Resistance of the Xa27(t) gene was developmentally regulated in IRBB27 and showed semi-dominant or a dosage effect in the cv. CO39 genetic background. As a prelude to cloning Xa27(t), a molecular mapping strategy was employed with a large mapping population consisting of 3,875 gametes. Three molecular markers, M336, M1081, and M1059, closely linked to Xa27(t), were identified to facilitate the mapping of Xa27(t) to the long arm of chromosome 6. The Xa27(t) locus was confirmed by chromosome landing of M1081 and M1095 markers on the rice genome. Markers derived from the genomic sequence of O. sativa cv. Nipponbare were used to further saturate the Xa27(t) genomic region. Xa27(t) was finally located within a genetic interval of 0.052 cM, flanked by markers M964 and M1197, and co-segregated with markers M631, M1230, and M449. 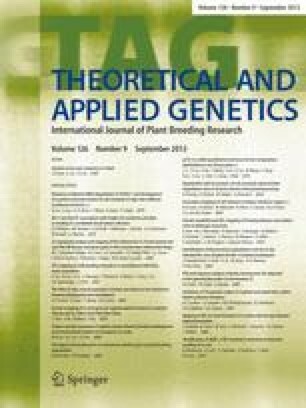 The authors would like to thank N. Naqvi, Y. Hong, and W.-C. Yang for critical reading of the manuscript; G. Khush, H. Leung, and R. Nelson for providing the rice cultivars; N. Huang for providing the DH mapping population; and Q. Zhang and J. Leach for providing Xoo strains. Our research was supported by Temasek Life Sciences Laboratory.